Hmph.. not really the case. It's snowing crazily here, and the lovely weatherman says 20 cm's by the days end. I don't mind the snow, but I hate the winter driving! And I do have places to go! About a week ago, I stepped out to go to work, and I looked up to this awesome crisp sky! The pinks were so vibrant and pretty, that I had to take a pic. Today, my pic would be as white as the page I am writing on! So, all 3 of my boys took food and fashion this year, when I was in school.. it was known as Home Ec. And of course, sewing and cooking are on the agenda. So instead of a loonie store tomato, I set out to make them pincushions, and they turned out to be some pretty cute chickens. Which then in turn sent me on a chicken mission, and I ended up with an army of them by the end of the day. They have been an awesome "little something" on my table at the markets, and want to thank everyone for all the chicken love! I pray no eyes have fallen off, I always worry about that! Anyways, this little guy is made out of muslin, and I have come to love this fabric, and sew, paint, and create things with it constantly. Like this little guy. His whole head is made from muslin, and then just painted white overtop. This is one of the patterns that can be purchased from Homebodies. They have a series of month to month patterns, as well as others. You can see, and purchase them all here. 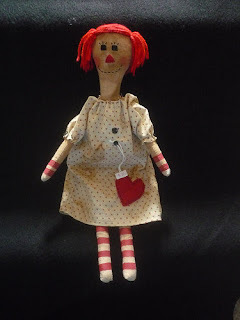 All the raggedy dolls I make, are also made from the same fabric, and then most are painted, tea stained and baked to give them an older, distressed look. 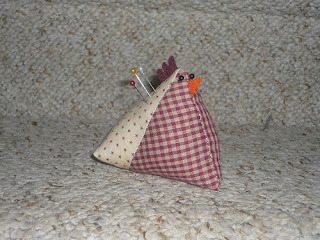 I hope to get some chickens, and a doll or two in my Etsy Shop very soon! Have a great weekend, and if you are out braving the roads this weekend, remember that you can get some great Christmas shopping done at the Christmas Bazaar at the Westerner this Saturday from 10 to 4!